Acrok Editing Software Solutions-convert any video for FCP, iMovie, Premiere, Avid, FCE, Vegas etc. 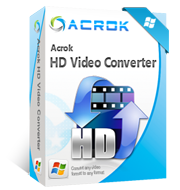 Acrok provides the best Sony, Nikon, Panasonic, Canon, JVC etc., video converter. Convert camcorder/camera footage to Apple ProRes, Avid DNxHD, Apple InterMediate, H.264, Codec, Let you edit MXF/MTS/MP4/MOV/WMV recordings in Final Cut Pro (FCP X, FCP 7, FCP 6), iMovie (iMovie9, iMovie 13), FCE, Avid Media Composer, Kdenlive, Keynote, Avid Xpress Pro, Adobe Creative Suite 6, Sony Vegas, Adobe Premiere (CS5, CS5.5, CS6, CC), Avid Media Composer, Windows Movie Maker, Magix Movie Edit Pro, Ulead DVD MovieFactory, Pinnacle Studio, CyberLink without any problem. How to convert HD and 4K footage foe editing software? Transcode 1080P/720P/4K/2K videos on Mac and Widows. Let you import and edit MXF/MOV/MTS/MP4 videos in Final Cut Pro, iMovie, Premiere Pro, Sony Vegas, Avid, Final Cut Express, etc., freely. Adobe Premiere Pro Supported Video/Audio/Image Formats. This guide shows how to edit video in Premiere Pro CC/CS6/CS5/CS4 on Windows and Mac. MTS to iMovie converter lets Mac users convert HD camcorders recorded AVCHD, MTS and M2TS files to Apple Intermediate Codec for importing and editing with iMovie. Sony Vegas Pro Video Converter, convert any video to Sony Vegas Pro 16, 15, 14, 13, 12 supported video/audio/image foramts on Windows and Mac. How to convert MTS to ProRes for Final Cut Pro X? Facing the problem importing M2TS files in Final Cut Pro X, you can fix the issues via transcoding your MTS video to FCP compatible format (ProRes MOV) first. Learn what video and audio formats supported by Final Cut Pro X, and how to convert any video to FCP X native editing formats on Mac. To make your own content with Blu-ray in Avid Media Composer, you'll need to rip and convert Blu-ray to Avid supported video formats first. Here's how to do it. To import MXF to Sony Movie Studio (Movie Studio 13 platinum, Movie Studio platinum 12) smoothly, you need to convert MXF to MPEG-2 video via MXF to Sony Movie Studio Converter. Why After Effects CC won't import H.265 files? How to solve H.265 can not be imported to After Effects CC for editing? This article will tell the reason and solution. How to import MXF footage into iMovie? How to edit MXF files with iMovie on Mac OS? Acrok Mac MXF video converter is a professional video converting tools for importing MXF to iMovie. Acrok Video Converter is an all-in-one Panasonic Camcorder video converter which can easily convert Panasonic video to avi, mp4, wmv, 3pg, etc, with fast speed and high output quality. This article gives you the best method to import 4K and 1080P MXF to Sony Vegas Pro 16 for editing without any issues. Learn how to. For importing XAVC S codec video into FCP X, you need to convert XAVC S MP4 to ProRes MOV via MP4 to Final Cut Pro Converter. 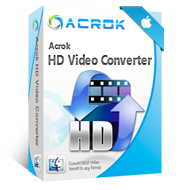 Acrok HD Video Converter for Mac is your best choice. If you want to convert Nikon cameras 1080P MOV on Mac, Acrok Video Converter will give you a hand. With this best Nikon MOV converter, you can convert MOV to any video format easily. With our best Blu-ray Ripper you can rip and covnert Blu-ray to Final Cut Pro best editing video format on Mac or Windows. You can free downlaod Blur-ay to FCP X Converter here. There is a best way to import MXF files into Premiere Pro CC/CS5/CS6 for further editing. Using a MXF to Premiere Converter to transcode MXF to Premiere Pro editable video on Mac or Windows. Keep reading for each process. Unable to import 4K H.265/HEVC videos to iMovie, you can easily convert unsupported H.265/HEVC to iMovie supported codec with best quality. How to use H.265 videos in DaVinci Resolve 15? There's no native way to do this- and here we'll give an alternative method to import H.265 to DaVinci Resolve 15 for editing without any loss. If you try to import MXF files into Premiere Elements, you may encounter unsupported file issues. Here is the best MXF to Premiere Elements 2019, 15, 14 solution. Having trouble importing 4K or Full HD H.265 videos into Premiere Pro CC? This guide will get rid of your trouble. How to get Apple ProRes codec video on Windows? Acrok HD Video Converter give me the best answer. Thanks!